Wheaton Regional Park, one of Montgomery County’s largest parks, offers a variety of recreational and educational opportunities. 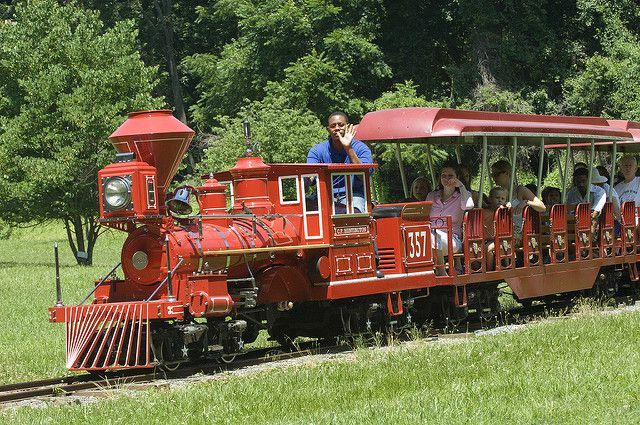 Visitors can tour Brookside Gardens, attend a nature program at Brookside Nature Center, explore scenic trails, take a ride on a train, go horseback riding, have a picnic, go fishing, ice skate, play on the athletic fields or on a huge playground, or relax in the shade. There are three separate entrances into Wheaton Regional Park: Shorefield Area, Glenallan Area, and Orebaugh Area. Adventure Playground - The park has more play areas than you can imagine. Play equipment includes endless climbing structures, swings, giant slides, a sand castle, and much more. Picnic tables, cooking grills, and picnic shelters accommodating up to 40 people are available (by permit only). Miniature Train and Historic Carousel - Children especially like the old-fashioned carousel and a train ride that goes through the park (operates weekends only in April and September and daily from May through August). Pine Lake - The 5-acre lake is stocked with several species of fish. Fishing is allowed with a permit. Trails - Wheaton Regional Park offers 11 miles of hiking, biking, and equestrian trails including paved and natural surface trails. Brookside Gardens - The 50-acre award-winning garden located within Wheaton Regional Park includes a variety of horticultural displays including an aquatic garden, azalea garden, butterfly garden, rose garden, children's garden, formal garden, fragrance garden, Japanese style garden, and trial garden. Educational programs are available for children and adults. Seasonal programs include the Wings of Fancy live butterfly exhibit and the Garden of Lights Show. Brookside Nature Center - The hands-on discovery center displays live reptiles, amphibians, fish, insects, mammals, and an observation beehive. Self-guided nature trails take you along interpretive boardwalks, wildlife viewing areas, and bird, butterfly, and native plant gardens. Wheaton Park Stables - Riding lessons are available in an indoor riding arena or an outdoor facility. The Stables also offer guided trail rides, children’s summer camps, and boarding. Wheaton Sports Pavilion - The covered, 200’ x 85’ multi-purpose sports field features state-of-the-art synthetic turf made with Nike Grind (manufactured from recycled athletic shoes); lines for soccer, lacrosse, and futsal sewn into the turf; new lighting, sound system and WiFi; four team rooms, a referee room and first aid room. The field is available to rent year-round. F. Frank Rubini Athletic Complex - The outdoor sports complex includes four softball fields, two baseball fields, outdoor basketball courts, and handball courts. Wheaton Indoor Tennis Facility - The indoor facility features six heated and air-conditioned tennis courts. Reservations are required. Lessons, clinics, party rentals, a pro shop, changing rooms, and showers are available. There are also six outdoor tennis courts available on a first-come-first-served basis. Wheaton Ice Arena - The indoor ice-skating rink is open year round and offers programs for recreational, freestyle, hockey, and speed skaters. The outdoor rink is available for leased ice time and parties from late October through mid-February. Dog Park - Dog owners exercise their dogs in the fenced area of the park. In all other sections of the park, dogs must be on a leash. Consult Wheaton Regional Park's website for more information.